Eighth District Representative Hon. Marlon Penn outlined plans to make fishing the Territory’s third economic pillar and ensure that the Eighth District capitalizes on the emergence of this pillar. Hon. Penn, who recalled the four point plan that he unveiled during the previous election, told his constituents that the time has come “to unleash the sleeping economic giant.” In fact, Hon. Penn stated that the fishing industry is an 80 billion dollar a year industry. The Eighth District Representative told the gathering at his public meeting that was held on 20 May that the opportunity is ripe to strengthen the Territory’s traditional fishing methods, like pot fishing, and line fishing by exposing fishermen to new technologies. “I, along with the rest of Team NDP, will develop a roadmap, to venture into other areas… such as long lining, fish farming, and sports fishing. We must expose our current and prospective fishermen to these new opportunities,” he announced. Additionally, Hon. 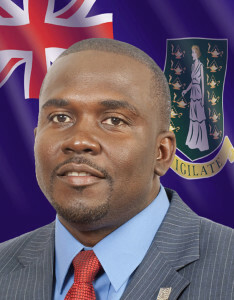 Penn stated that plans are already afoot to ensure that the proper laws/policies are in place and enforced in order to protect against over-fishing, and illegal fishing within BVI waters. “We will use modern technology (like GPS and other methods) to better protect our banks and police our waters,” he added. However, the District Representative stated that while his vision for the new fishing industry is clear, he sees other spin-off opportunities from the facility that is located at Red Bay, once fully completed. The incumbent further disclosed his vision for the District: “I also envision an opportunity…for a twin fishing and farmers market, where there is a supply of fresh fish and fresh produce. I also envision…Red Bay as a potential port of entry… as the Seventh and Eighth Districts combined represent over 10,000 residents, with tremendous potential in the maritime space. I see an opportunity…for our local charter boats…and ferry operators…embarking and disembarking with busloads of tourists…who were picked up from the newly built Cruise Pier…I see these tourists visiting our heritage tourism sites in Districts Seven and Eight, and subsequently leaving Red Bay for a tour of our outer islands,” he shared.